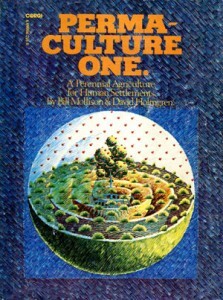 Mollison, B. and Holmgren, D. Permaculture One published by Corgi 1978 and since published in 7 languages (now out of print). Ben, from Dancing Rabbit Ecovillage, in Rutledge, Missouri, has written an informative and very humourous piece that answers the question: what is permaculture? More precisely permaculture is a “design system based on ecological principles” (see below) which provides the organising framework for implementing the above vision. In this more limited, but important sense it draws together the diverse skills and ways of living which need to be rediscovered and developed to empower us to move from being dependent consumers to becoming responsible producers. In this sense, permaculture is not the landscape, or even the skills of organic gardening, sustainable farming, energy efficient building or eco-village development as such, but can be used to design, establish, manage and improve these and all other efforts made by individuals, households and communities towards a sustainable future. Permaculture is also a world wide network and movement of individuals and groups working in both rich and poor countries on all continents. Largely unsupported by government or business, these people are contributing to a sustainable future by reorganising their lives and work around permaculture design principles. In this way they are creating small local changes but ones which are directly and indirectly influencing action in the wider environment, organic agriculture, appropriate technology, communities and other movements for a sustainable world. After 40 years, permaculture may rank as one of Australia’s most significant “intellectual exports”. Dr Carol Patterson, who lived with David in Tasmania in the late 70’s has written this piece, which first appeared in The Mercury. You can read David’s personal account of his journey into permaculture in Permaculture Pioneers: stories from the new frontier, as well as the stories from other early adopters. This video is an excerpt from the presentation available on the Permaculture Ethics & Design Principles DVD and also the Teachers’ DVD which forms part of the Teaching Kit. The Teachers’ DVD also contains an additional video and a range of additional digital resources as well as the cards, principle magnets and booklet which are all part of the Teacher’s Kit. For further explanation of the principles read Essence of Permaculture (now available in nine different languages) or get the book Permaculture: Principles and Pathways Beyond Sustainability both by David Holmgren. But by far he best way to learn about permaculture is to take part in one of the PDC courses. The list of courses David Holmgren is involved in is listed here.